Around 1650 in Rome, the Flemish artist Michael Sweerts (1618-1664) created a series of seven pictures entitled Seven Acts of Mercy. Each is of nearly identical size and depicts one, two or three foreground figures set in a dramatically lit landscape (or in two cases in a cavernously dark interior). Together the cycle of seven paintings comprises his greatest work. This picture is probably the last of the seven. Sweerts captures well the somber mood of the moment. Although the day draws to a close, just enough light falls across the narrow range of colours – earth-based, mostly browns and dark greens – to focus our eyes on the creamy white cloths wrapped beneath the corpse and around the head of the grave-digger. The composition places us, the viewers, right on the edge of the freshly cut grave to which the old man has led the bier behind him. In the background the diagonal lines of the Roman campagna, with its distinctive architecture, reinforce the tight triangle of the three protagonists. Sweerts conveys a profound sense of empathetic compassion. The same muscular young man appears to have served as a model for both the grave-digger and the corpse, a gentle reminder that each of us is mortal. The kindly old man wears a dark blue vest, possibly denoting his membership in a lay confraternity of the kind which Sweerts himself later joined. With their contemporary dress and humble demeanor, these men claim no special recognition. And yet Sweerts gives us the unmistakable impression that in its solemn dignity this moment is holy. As these figures recall the entombment of Christ, they invite us to consider the holiness – or potential holiness – of our own deeds. The seventh work of corporal mercy, enumerated specifically by Augustine and Benedict, was the burial of the dead. The scriptural evidence for this seventh act is more obscure, namely the example of Tobit in his eponymous book, consigned by Protestants to the Apocrypha. But the everyday virtue of the act across medieval Europe was obvious, as a series of plagues struck densely packed towns and cities. To participate in a burial was a final and purposeful kindness to the dead and to their families. What does mercy mean in your life? How, in practical terms, might you be an instrument of Love Divine, whose birth in human form casts all humanity in a new light of dignity? In his evocation of this seventh work, Sweerts shows each of us that acts of mercy – unseen and ordinary though they may be – not only encourage one another but allow us ourselves to become more fully human. 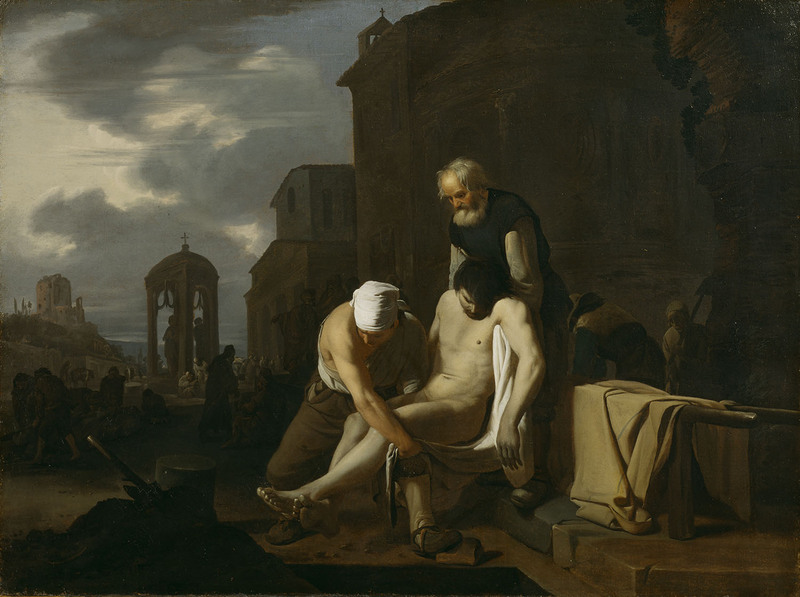 Michael (Michiel) Sweerts: Burying the Dead, c. 1650, oil on canvas, 74 x 99 cm. Wadsworth Atheneum Museum of Art, Hartford, Connecticut, USA, Ella Gallup Sumner and Mary Catlin Sumner Collection, 1941. Sweerts painted the seven-painting cycle for Joseph Deutz (1624-1684), whose prominent Amsterdam trading family was Sweerts’ greatest patron. Joseph hung the pictures together in the purple reception room of his house, still standing at No. 450, Herengracht. Four of the other six paintings in the cycle remain in Amsterdam today at the Rijksmuseum (Feeding the Hungry; Refreshing the Thirsty; Clothing the Naked; and Visiting the Sick). Harbouring the Stranger (including a self-portrait by Sweerts, staring hauntingly at the viewer) is in Germany (Arp Museum Bahnhof Rolandseck / Remagen; Collection Rau for UNICEF). Ministering to Prisoners is in a private collection in Europe. Michael Sweerts (1618-1664) was born in Brussels to a prosperous family with ties to the textile trade. We know nothing of his artistic training, but he was living with other Northern painters in Rome by 1646 and may have operated an informal drawing academy there for other artists who shared his passion for the lessons of the Antique, Renaissance and Baroque periods. Sweerts conveyed in his work the lessons of Counter-Reformation teaching and benefitted from the generous patronage of the church. His faith also profoundly shaped his life. After a few years in the late 1650s in Brussels (where he led another art school, intended to help revive the tapestry-making industry), about 1660 he joined a newly formed French Catholic confraternity called the Société des Missons Etrangères, under the leadership of François Pallu, Bishop of Heliopolis. By late 1661, the society had set off from Amsterdam for China, traveling overland to Marseilles, from which Sweerts and another nine lay and clerical evangelists set sail for Palestine in early January 1662. The journey was difficult and four of the ten men died. As the company continued on through Syria and eastern Turkey to Tabriz in northern Persia (now Iran), the opinionated Sweerts grew irascibly argumentative. Once the group reached Isfahan in central Persia, the Bishop dismissed him from the confraternity’s ranks. Somehow Sweerts made his way to the Indian coast; he died in the Portuguese Jesuit enclave of Goa two years later.